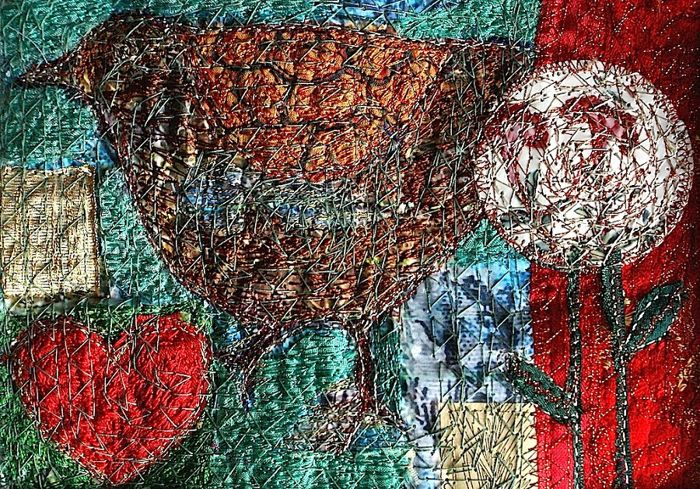 Anne Kelly is an English textile artist who does something truly amazing: she makes art using recycled fabrics and paper. 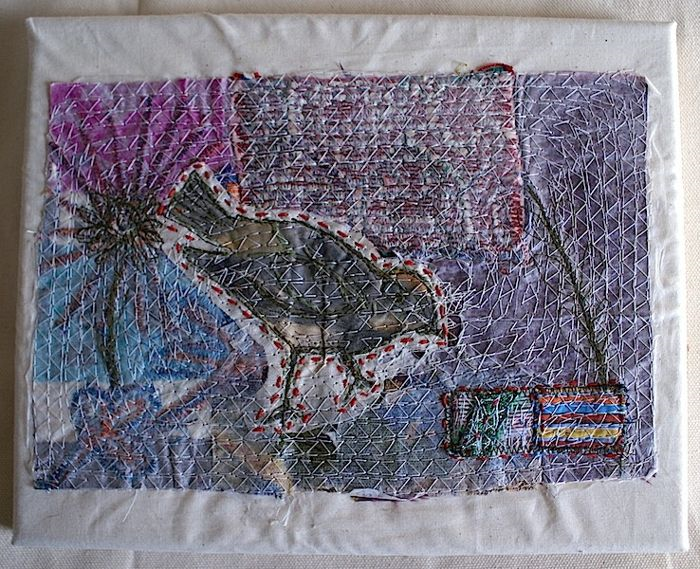 Her embroidered or stitched textile panels are inspired by her travels and by folk art. Anne Kelly is also a writer, a blogger and a teacher. The pictures you’ll find in the article and her own words are going to tell you her story as a woman and as an artist. Personally, I love her story because I find that it has an inspiring, wholesome quality to it. Maybe it is because I adore the people who choose recycling as a way of making art and as their own raison d’etre. Enjoy the interview! 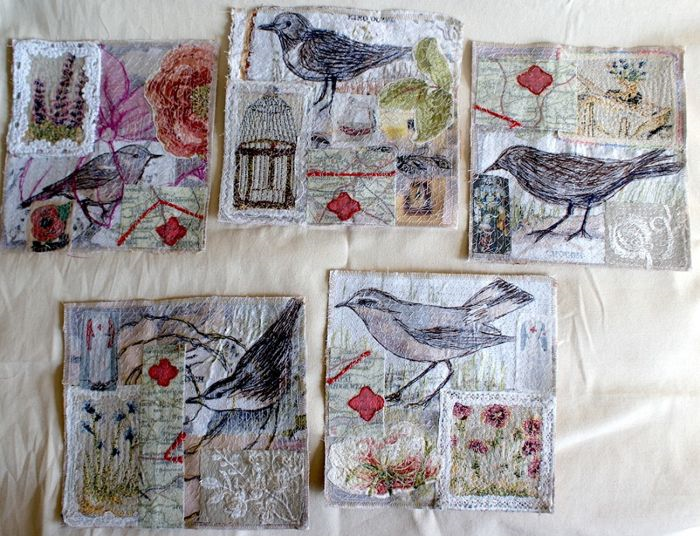 DHG: hi Anne, I love everything that has to do with collage, fabric, and sewing. So you can imagine how excited I am to talk to you! 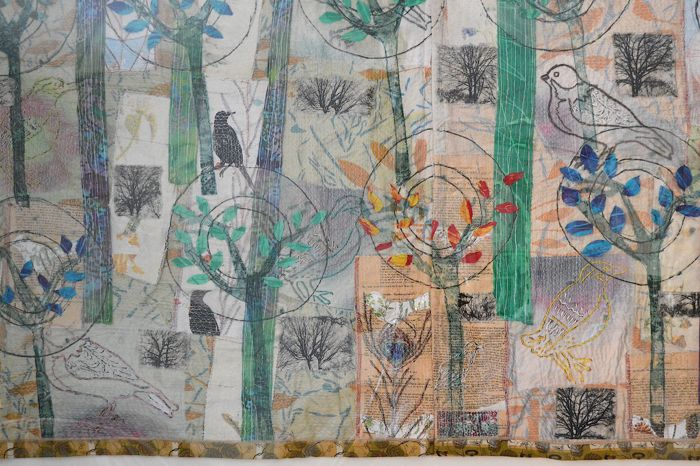 Can you tell us about your work as a textile artist and how you got so far? ANNE: hi Annalisa and thank you for getting in touch and your kind words about my work. I trained as a fine artist in Canada and at Goldsmiths College in the UK. I raised a family and devoted my time to teaching and making work for charity events. Later on, I began exhibiting in local and regional venues. 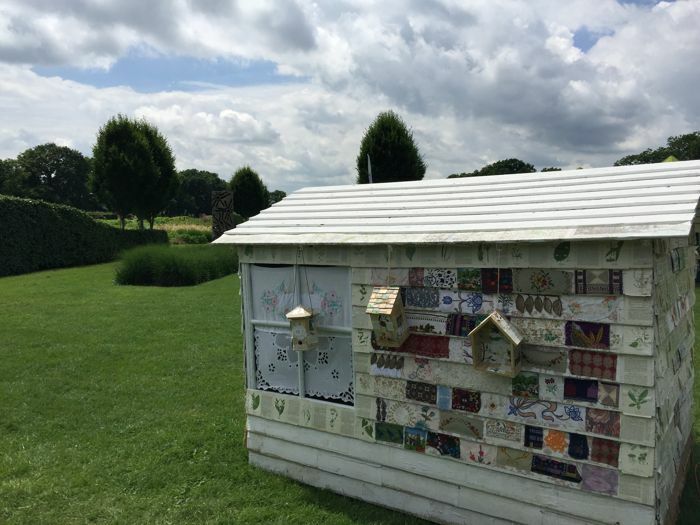 I became artist in residence at Sussex Prairies Garden in 2014. This was an opportunity to work with conservation charities and create a new piece of work ‘Wildflower Teacloth Sketchbook’ which was exhibited at the Prague Patchwork Meeting in 2015. I now exhibit and teach nationally and internationally. I’m guest artist at the Knitting and Stitching Show in London and an invited tutor at Fiberarts Australia and New Zealand in 2017. D: what is your favorite subject matter for your art and why? A: I would have to say nature –it is the basis for all of my work. 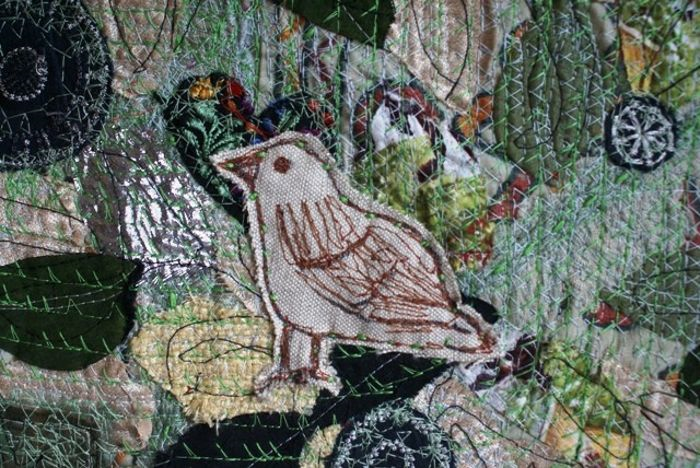 Artists, designers and makers have always influenced by nature, and textile artists even more so. An early series of textile work was based on drawings of plants from the garden. As my pieces have grown in size and complexity, I’ve kept and valued a connection with the natural world. Through my teaching and travels with my work, I’ve observed that practitioners of all ages and abilities share a huge common love of nature and textiles, which has inspired me to write my new book. I have used plants, flowers, trees, birds, insects and landscape in my work. D: I completely agree with your decision to use recycled textiles, basically fabric with a story to tell. It is an environmentally responsible way to create beauty from something that has been discarded. Is it a purely “romantic” choice or is there something else? A: I have always been drawn to vintage and recycled fabric from an early age. I used to go to jumble sales and charity shops to collect fabric and clothing. This habit continues and now people generously donate embroidered table linen to me – I often use it as a base for my stitched work, as it has a patina and a soft and worn feel which you cannot find in new textiles. I like the quotidian – the everyday and used pieces of textile have this feel about them. I like to imagine who would have used and worn these items. As well as the green imperative, it is a visual and aesthetic choice. D: your book, ‘Textile Nature’ is so wonderful that we have decided to sell it on our DHGShop. Would you like to tell us about it? A: thank you Annalisa! I was commissioned by my publishers Batsford to write the book in 2013. It took three years of research and editing to produce it. I wanted it to have a tactile and visually exciting feel to it – for it to be a book that people really wanted to own. It has over 30 artists’ work and features a number of institutions and organisations that promote and work with nature. My photographer Rachel Whiting works mainly with natural light and her photographs lend a ‘glow’ to the book. D: bridges are structures connecting places that are seemingly foreign to one another, and help overcome obstacles and facilitate communication. This is also true about your work. If you could wrap any bridge in the world in one of your works, which bridge would you choose? A: what a wonderful question! It would have to be the Ponte Vecchio in Florence. I love it because it has buildings all along it. I have recently covered Noah’s arks and a shed with textiles so this would be a fantastic challenge. Florence is a wonderful city, like a museum with so much to see. I particularly like the artinsal shops and markets that still exist with food and craft made in Italy. D: finally, is there a textile project that you have been thinking about for a while and that you have not been able to accomplish yet? A: I would like to produce a series of work about my family’s history, which like many of us encompasses many faiths, countries and cultures. It is challenging to produce authentic work that is not overly sentimental in relation to one’s own family. I have several ideas for ‘ways in’, and am preparing for a major exhibition in Canada in 2019, so may have resolved my dilemmas by then. You can visit Anne Kelly‘s website.